Back in January, I kicked off the year of 2013 with Turgeon's Godmother: The Secret Cinderella Story (read my review here). I fell in love with the novel, and with Turgeon's dark and twisted, yet beautiful approach to such a classic fairy tale. 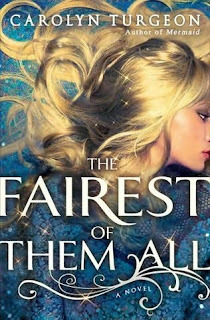 Last month, I was contacted by Simon and Schuster and offered a copy of The Fairest of Them All for review. Needless to say, I was thrilled at being given the opportunity to read Turgeon's latest work because I absolutely LOVED Godmother! The Fairest of Them All is a fairy tale mashup about the lives of Rapunzel and Snow White. Deep in the forest, hidden away in the ruins of an old castle, Rapunzel lives with her guardian Mathena - a beautiful witch who makes a living "curing" women of their unwanted pregnancies and various other illnesses. One day when Rapunzel is 17 years old, her voice manages to enchant and lure the most handsome man she has ever seen right to her doorstep. Before she learns that the man is Josef - prince of the nearby kingdom - Rapunzel has already fallen hopelessly in love with him. But, for Rapunzel's "own good," Mathena prevents Rapunzel from running away with the beguiling young prince by keeping her locked away in the tower. As those familiar with Rapunzel's story already know, being locked up in a tower doesn't stop Rapunzel from letting her hair down and helping the prince gain entry to her room. When the prince eventually leaves Rapunzel to return to his kingdom, Rapunzel is heartbroken, and becomes even more so when she learns that he has married his betrothed and produced an heir to the throne - a beautiful young girl we all know as Snow White. Rapunzel continues to mourn her sweet prince as years pass. It's not until the queen dies a mysterious death does Josef once again search for Rapunzel with hopes of making her his new wife. However, the two may not live as happily ever after as Rapunzel had hoped - especially while Snow White remains the fairest of them all. Turgeon has such a simple and elegant writing style - her work could appeal to all audiences and easily qualify as timeless classics. I love how dark her stories are and how you gain that sense of impending doom from the get-go. You just know that the fairy tale is going to be an (oh so delectable!) train wreck, and that the characters will have lessons to learn before the book's end. In all its eloquence, The Fairest of Them All has such a gloomy tone, yet glitters at the same time. All throughout the story, you can tell that Rapunzel is right on the verge of becoming dark and ugly, and has absolutely no clue of her impending demise. This Rapunzel/Snow White mashup is highly original - and you'll begin to see parallel themes in the story that align with what you've always known about the original fairy tales. Fans of the television series Once Upon a Time will eat this one up. Too bad there aren't television commercials for books, right? If they did, Turgeon would corner the market during the time-slot for that one. Compared to Godmother, I feel that The Fairest of Them All is less intense and less emotional, but all in all, it's still such a beautiful classic tale. I think Turgeon has definitely found her calling as an author, and that her gift lies in recreating fairy tale mashups. I'm already looking out for her next novel. Carolyn Turgeon is also the author of Rain Village, Mermaid, and The Next Full Moon. What are your favorite fairy tales of all time? Which fairy tale would you like to see retold in today's literature? Share your thoughts with us in the comments section below.